Just in case nobody has told you this lately… your brain is amazing! This vital organ contains billions of nerve cells, arranged in patterns that coordinate your thoughts, emotions, movements and senses. Your brain completes up to five trillion chemical reactions every second at speeds of over 260 miles per hour, to allow you to go about your daily activities. And it’s constantly active, 24/7, even when you’re asleep. Being such a powerful and complex organ, your brain is also highly sensitive to your physical and emotional state. Ever notice how after a high-pressure day at work or school, you struggle to think clearly? You might forget where you put your keys, and spend 20 minutes searching before you realize they’re in your hand! This is because your brain is responding to the stress you experienced during the day. It’s not functioning as well as it normally would. Now, we all have stressful days sometimes, and we all deal with those annoying after-effects where we feel forgetful or muddled. After a good night’s sleep, our brains and bodies are ready to take on the world again. But what happens when you’re consistently exposed to extreme levels of pressure in your day-to-day life? This is where chronic stress becomes a problem for your brain. Gary and Michelle’s BE GREAT techniques give you a healthy antidote to the hormones adrenaline and cortisol, which are produced by your brain in times of stress. That’s because these techniques prompt your brain to produce Dopamine, Oxytocin, Serotonin and Endorphins (DOSE). These balancing hormones counteract stress, and allow your brain to start operating at optimal levels again. Let’s take a closer look at stress hormones, what they do to your brain, and how you can counteract them by getting your DOSE. Firstly, when you’re exposed to stress, the amygdala (the part of your brain responsible for emotional processing) reacts by sending out a distress signal.This signal triggers a stress response in the hypothalamus, the part of the brain that controls things like body temperature, thirst, hunger, sleep and emotional activity. The stress response, commonly called the “fight or flight” response, gets your body ready to react to a threatening situation – either by fighting the threat, or running away from it. The fight or flight response floods your system with the hormone adrenaline. This adrenaline surge increases your heartbeat and pulse rate, pushes up your blood pressure, and quickens your breathing as your body pumps more oxygen to the brain. This is a physically and mentally exhausting process, which is meant to help you respond to immediate danger. It’s not something your brain should have to cope with on a continual basis! But in the case of chronic stress, that’s exactly what’s happening. Consistently high levels of stress hormones, like cortisol and adrenaline, affect the functioning of the nerve cells in the hippocampus (the part of your brain that’s responsible for memory). That’s why you struggle to concentrate or remember information when you’re chronically stressed. 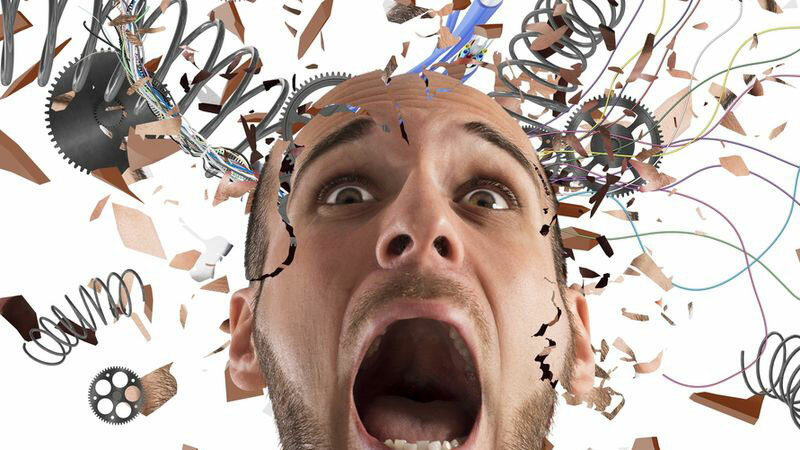 Stress hormones also impair the functioning of the brain’s frontal lobes, which are responsible for the higher-grade stuff like reasoning, mental focus and judgment. The result? Poor decision-making and a constantly foggy, muddled brain. Basically, all the parts of your brain that help to keep you mentally sharp, are caving under the added strain of elevated cortisol and adrenaline, high anxiety levels and physical fatigue that come with chronic stress. Just like you’d wear a helmet to protect your brain from physical injury when playing a sport, it’s critical to make sure you protect this precious organ from the damage caused by stress in high-pressure situations. Here are a few simple steps to get you and your stressed-out brain back on track. Your brain is composed of 60% fat, and needs plenty of healthy fats in order to function properly. You’ve heard people talk about “brain food”? This means food that’s high in essential fatty acids, also known as omegas. By eating healthy foods, you are countering energy depletion, as your body produces serotonin, a vital hormone that works against the negative effects of excessive stress. To nourish your brain, eat a balanced diet that’s rich in omegas. Avocados, nuts, olive oil, salmon and other oily fish are great (and tasty) sources of these “building blocks” for a healthy brain. Taking a DHA (omega-3 fatty acid) supplement can also help to protect your brain against the damaging effects of cortisol. A good quality supplement will give you extra nutritional support in times of stress. Regular exercise increases a substance known as Brain-Derived Neurotropic Factor (BDNF),which strengthens the brain cells and boosts mental performance. Exercise is a great physical and mental stress-reliever. If you’re under pressure, a quick workout could be just the refresher you need to get those feel-good endorphins flowing. This can have a huge positive impact even if it’s just for 15 to 20 minutes a day (as suggested by research from Penn State University). Activities like meditation, prayer or mindful yoga help you to re-focus and de-stress. They lower the blood pressure and heart rate, and help to ease anxiety. This “relaxation response” will benefit your body and mind, especially if you stick with your mindful habits over a prolonged period of time. These simple but powerful tools will benefit your brain and body in so many ways. B: BREATHING Take slow deep breaths, to send a message to your brain to calm down and relax. Try breathing in deeply to the count of four, hold for four and breathe out for four. E: EXPECTATION If you expect the world to work in a certain way which is not based on reality, then you will create failure, disappointment and stress. Expectation is the mental approach to avoid increasing your stress unnecessarily. G: GRATITUDE Focus on what you are grateful for throughout the day, and your brain will release regular amounts of dopamine. R: REFRAMING Look at challenges from a positive perspective, and your brain will release mood-boosting serotonin..
E: ENERGY Stress depletes your energy levels, so eat regular, balanced meals and exercise daily to release endorphins. A: ARTICULATE Think before you speak. Choose positive and appropriate words, and your brain will produce oxytocin, the happy hormone that improves optimism and self esteem. T: TEAM Increase your support. Note how those around you behave when they’re under pressure, so that you can help them if needed. In return, they’ll help you cope with stress. Don’t let stress get the better of your brain – the better you look after this incredible organ, the better it will work for you.